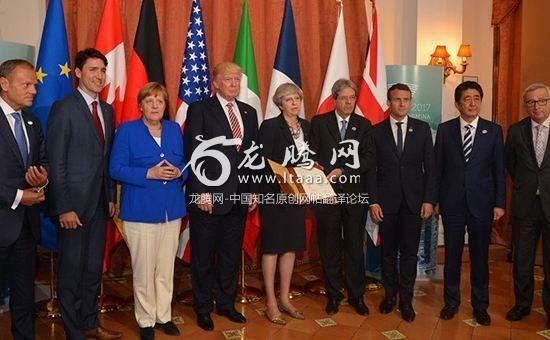 七国集团（G7）是不是已经凉凉了（1） [美国媒体] Is the G7 dead? There’s no secret that this forum’s influence has been waning in the last decade or two. With China and India’s rise, why should Canada and Italy have a disproportionate amount of global influence. The USA already dominates the G7 nations and its economy is larger than all the other G7 nations combined. At the latest meeting it was evident that Trump does not take this group seriously. I think many Americans have held similar views for some time. I propose a group of consisting of China, USA, India, EU, Japan (and perhaps UK, France, Germany, Russia and Brazil) replace the G7 as the preeminent global economic leadership forum. There’s no way we can tackle climate change, failed states, and global poverty without an intimate annual meeting that includes the world’s major players. I do believe middle powers should play a role, so perhaps rotate in 3 G20 countries each year to give the group some balance. I'm not sure, this is far outside of anything I've studied in depth. I would say that one presidential cycle of shenanigans =/= to the G7 being suddenly dead. Life goes on, and barring some truly big events, things tend to return towards normalcy. Looking at a brief overview of the focus at this last summit, it looks as though the goals are long-term and based around pragmatic humanist values. That seems to be the kind of thing which is insulated from temporary setbacks and thespians. If I was more familiar with the matter I'd say that CANZUK, should it occur, may well be the next thing this sub makes dramatic speculation about from a position of relative ignorance. A lot of issues that are seeing people develop opinions like "now things are truly different" will just revert to the status quo, G7 being one of them. Do you see CANZUK as a possibility? Personally my opinion is that strengthening certain aspects of the old commonwealth is a realistic possibility, one example being taking the age limit off the working holiday and expanding how often citizens may take advantage of it. I say that because one of the original stated goals was freedom of movement; that seems to be wishful thinking, a stretch goal, or something to test the waters. If it were more than that, one would expect there to be more dialogue within the narrative about crown land, development, and the reality of proposals. The legal frxwork is something that I am truly lacking in knowledge of; I'd assume altering what already exists is much easier than creating anything new. Yes it if were purely about economic power Canada and Italy would not be there. But as several leaders have repeatedly stated, its an economic summit of countries that share values. So many prominent Americans have made statements apologizing to Canada and other US allies in the past few hours for Trump's behavior (Mccain for example), attempting to reaffirm that the vast majority of Americans value these allies and their economic ties. So I missed this...what did he do at the G7? He was late to a meeting, left early and called Canada dishonest. He also kept calling for Russia to be reinstated, hand waved the Crimea annexation, threatened other member countries to not retaliate to US tariffs, refused any bilateral meetings with Theresa May, specifically called Trudeau dishonest and weak and then pulled the US out of the G7 joint statement that involved promoting low tariff trade and a commitment to reduce environmental pollution. Agreed to a final statement and 2 minutes after airforce one lifts off the ground he walks back on his words - via Twitter - and takes it all back. also included in the joint statement was further decrying Russia's actions in Crimea, which may have been the deciding factor for someone like Trump if the puppet theories are given any credence. I would agree, once Trump leaves office, or perhaps before, I suspect we'll see an attempt to return to the status quo. Whether the EU will be as willing to just move on is a different matter. From here on in they may try to be more assertive in these sorts of bodies. Italy has an economic mass which is very close to that of France, which in turn is close to that of Germany. So removing Italy entails removing France and Germany. Germany's economy is literally twice as large as Italy's economy. The gap between France and Italy isn't small, and the gap between France and Germany is even bigger. EDIT: Besides, the economic output of a country is not the only thing that matters. Out of the largest economies in the world, it is arguably Germany that has the healthiest economy at the moment, all things considered.